The year is 1985 and Puma have triumphantly announced the first ever computer shoe. 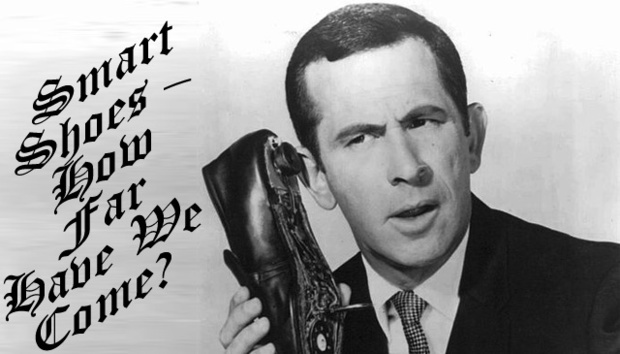 It’s completely unheard of…a computer in a shoe? The shoes feature a built-in pedometer and you can hook it up to your Apple IIe or Commodore 64 computer (if you are lucky enough to own one) and track your distance and calories used. But the reaction is not exactly complimentary. Alison Turnbull, shoe correspondent for Running magazine, thinks the whole concept is a bit “dodgy”, and argues that “no person, however rich, should pay $US 100 for a pair of running shoes.” Allan Lundell, at DigiBarn Computer Museum gives these shoes a test run in Santa Cruz, California: “Nothing could get people's attention more than bending down and pushing a button on your shoes and hearing them beep, the definitive nerd". Fast-forward to the future and how wrong was he? Nike are doing better than ever with its Nike+ range. The “smart” shoes are embedded with pressure sensors and an accelerometer that can record distance, number of steps and jump height over time. And Nike has Puma to thank for that. 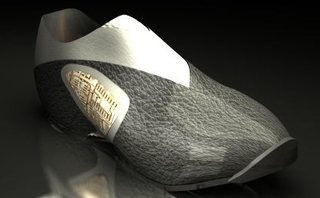 The “smart” shoe concept has stuck and the ideas keep evolving. Indian startup Ducere Technologies Pvt is planning to sell its Bluetooth enabled Lechal – (which means ‘take me there’ in Hindi) shoes for more than $100 a pair in September. The shoes sync up with a smartphone app that uses Google maps, and vibrates to tell users when and where to turn to reach their destination. So what have been the revolutionary breakthroughs over the years that have led to the Nike+ and the “smart” shoes of today? 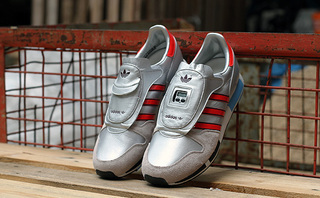 Adidas’ introduction of the Micropacer in 1984 was a massive technological breakthrough in the world of running shoes. The metallic silver design set it apart from the competition but it was its technological integration that really made it unique. It was the first shoe to electronically measure the runner’s distance, average speed, calorie consumption, and save the total route covered. In celebration of its 30th anniversary, Adidas will re-release its revolutionary Micropacers this month. You can see the original ad here. 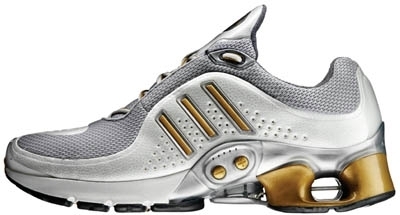 Some years later, in the year 2005, Adidas announced the intelligent running shoe: Adidas-1. Some people confuse the Adidas-1 as being the first “computer shoe”. 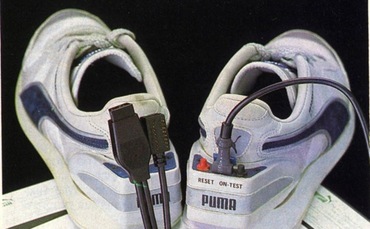 But this was actually the second general consumer shoe to incorporate a computer after the 1985 Puma RS Computer Shoe (see above). The Adidas-1 provided “intelligent cushioning” by automatically and continuously adjusting itself. Adidas spent a whopping three years working on this secret project. Apparently the microprocessor was capable of making five million calculations per second. It retailed for around $250. Perhaps not in the same league as Puma and Adidas but good to put in for fun. 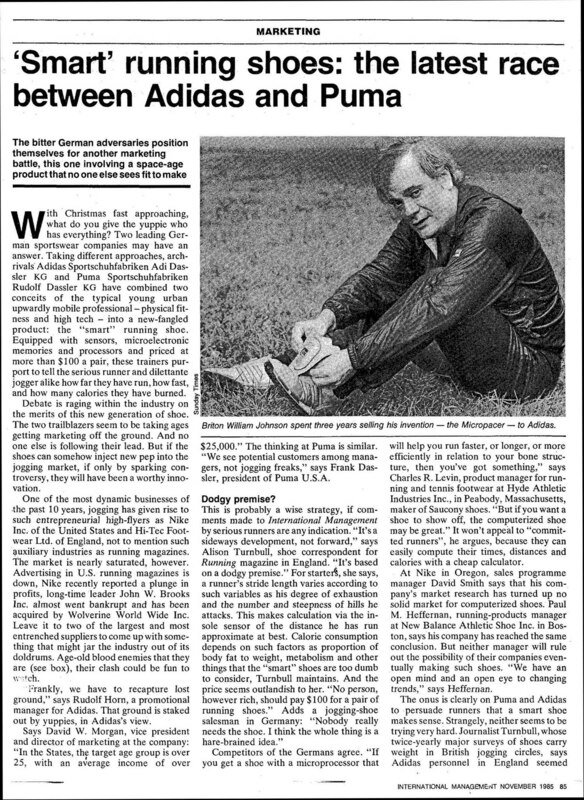 In 2004 MIT spin-off company VectraSense announced a new computerized shoe named “Verb for Shoe”. In simple terms, these shoes had an embedded computer that automatically adjusted the shoe to your feet, synced with your PC, and communicated with the shoes of others to exchange contact information. To get the basic shoe you would have to pay around US$499.99. But to get it fully loaded you were expected to spend a crazy US$1000. Last year Google unveiled a talking shoe. After all, what’s left? The man: Who are you talking to? The shoe: The other shoe. The shoe on the other foot. It thinks I'm its mate, but I'm not. I'm your mate. The man: You're my shoe. The shoe: I could be so much more than that, if you'd let me. Why are we stopping? The man: I've been hit by a car. I can't feel my other foot. Is my leg broken? The shoe: Do I look like a doctor? Wearing talking shoes might be mad – but then again, that’s what the world thought when they were walking around with a computer sticking out of their shoe in 1985.